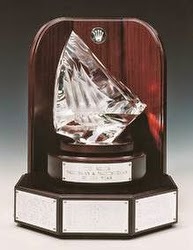 J/Sailors Compete for Rolex Yachtsman & Yachtswoman of the Year! (Newport, RI)- The nominees will be reviewed by a panel of notable sailing journalists who discuss the merits of each sailor’s racing results before voting to determine US Sailing's 2014 Rolex Yachtsman and Yachtswoman of the Year. The winners will be announced in mid-January and honored on Thursday, February 26, 2015, during a luncheon at the New York Yacht Club in Manhattan, when they will be presented with specially-engraved Rolex timepieces. 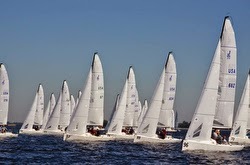 Many of the top nominees are past or present J/Sailors from the top J one-design classes (J/22, J/24, J/70, J/80). Of the ten contenders for Yachtsman of the Year, seven (70.0%!) have extensive sailing experience on J’s, including Etchells World Champion Bill Hardesty (San Diego, Calif.); J/70 World Champion Tim Healy (Jamestown, R.I.); Rolex Farr 40 World Champion Terry Hutchinson (Annapolis, Md. ); J/80 World Champion Brian Keane (Weston, Mass. ); Extreme Sailing Series Champion Morgan Larson (Santa Cruz, Calif.); ISAF Sailing World Cup 470 Men’s Bronze Medalist Stu McNay (Providence, R.I.); and J/24 World Champion Will Welles (Portsmouth, R.I.). Of the seven contenders for Yachtswoman of the Year, five (71.0%!) have spent considerable time sailing J one-designs; including J/70 Worlds Corinthian Champion Heather Gregg-Earl (Boston, Mass. ); ISAF Sailing World Cup 470 Women’s Bronze Medalist Anne Haeger (Lake Forest, Ill.); Etchells skipper Shannon Bush (Refugio, Texas); ICSA Women’s National Champion Deirdre Lambert (Cumberland, Maine); and US Women’s Match Racing Champion Stephanie Roble (East Troy, Wisc.). Where have all the young sailors gone? “We have always believed in and supported youth sailing, which has now expanded from junior sailing schools to high school to college. The latter programs continue to pop up everywhere and young people can now start out at 6 years old and sail extensively on teams up into their early twenties. They have terrific opportunities that we never had at that age. We are cranking out more well trained sailors than ever before. 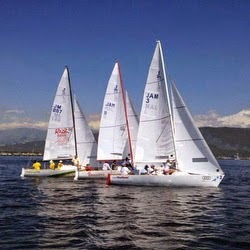 At the same time we hear that not enough young people are sailing and racing once they graduate out of these programs. We have more skilled young sailors but they are not sticking with it. Why doesn’t this add up? I don’t buy the idea that kids (I use that term loosely) stop sailing because boats are no longer given to them to use. There are so many crew shortages, even boats they can borrow, that opportunities to sail are everywhere. Used boats are very inexpensive right now; being in the business I can say that with confidence. Many small used one-design boats are practically being given away. In our opinion, the problem lies elsewhere. If a youngster starts sailing at six years old and stays with it through college, he/she will have been sailing for most of their lives to that point. Frankly, for them to opt out at this point, it is often a case of “been there, done that”. Those hours and days spent sailing in dinghies were hours they were not playing golf, tennis, softball, fishing, scuba diving, swimming, biking, and many other activities they now want to try. Young people today have so many opportunities and are accustomed to doing many different things for entertainment. Sailing gets crossed off the list and they are ready to catch up on what they missed. The other issue is that if sailing as they know it means more short-course races in small boats many of them have had their fill after 10-15 years of doing it. Some are just plain burned out. A percentage of these skilled and enthusiastic dinghy sailors will stay with it. Others will come back to the sport when they are older, often much older. But if we want to keep more young sailors engaged in the sport in their 20s and 30s, they need to see more of a return on their time in the form of fun and social interaction. This likely means a different type of sailing than what they have been doing. (Montego Bay, Jamaica)- Check out this YouTube video below. Gorgeous weather. 10-25 kts warm trade wind breezes from the ENE all day. Gorgeous sunsets. Amazing hosts. Laid back atmosphere- that is what Montego Bay Yacht Club is all about. Lots of warm, engaging camaraderie! (Algarrobo, Chile)- Over a three-day weekend in December (the 6th to 9th), the last event of 2013-14 Chilean J/105 National Championship took place off Algarrobo. An excellent, highly competitive field of seventeen teams were on the starting line, ready to do battle to determine the season-ending leaders for this hot local offshore fleet. The weekend’s weather Gods smiled on the 105 sailors, providing them great wind conditions, with 10 to 15 knots southwest breezes (the best local wind) and enormous waves over 6.5 foot tall! From the earlier regattas, it was clear the three teams that were dominating those events would have to settle in for a three-way battle for the top spots on the podium. Or, they would have to contend with a “late bloomer”, a new team ready to ascend the leadership with better tacticians or crew. Repeating as they had from 2013, Team SCIMITAR skippered by José Ugarte, finished in the first place thanks to their consistent 1sts, 2nds and 3rds. Miguel Salas’ BIG BOOTY followed closely with 34 points to take second overall, but had to win a tie-breaker over the PLAN B team skippered by Jorge González. PLAN B got the short end of that stick due to fewer top three finishes. The Chilean J/105 fleet will race again in the "Sailing Week 2015", where many class and fleets join to celebrate this event. This will take place from 24 to 31 January of 2015 off Algarrobo as well. J/122E SKADOOSH Loves Indian Sailing! 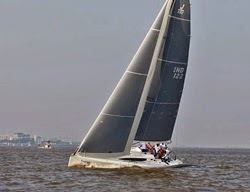 (Mumbai, India)- The 16th of November saw an armada of sailboats sailing out of Mumbai’s harbor (the Gateway to India) to participate in a regatta organized by Commodore Rabi Ahuja in memory of his father. The late Gokaldas Ahuja had set up the first “Sea Scout” group in 1938 that came to be known as the Sea Cadet Corps- its goal was to introduce Indians to the sea and sailing and to enjoy friendship and teamwork together. Weather conditions on the land were the best Mumbai had seen all month – owing to the surprising showers a few days earlier. However, the sea had been rough the day before and several people at the jetty were discussing how the erratic wind conditions would affect the outcome of the race. The team members on the J/122E, were confident of the boat’s ability to adapt to the shifty wind conditions and out sail the competing boats. The race spanned three fleets, including one for children under 15, and the J/122E’s course was a loop finish on the beat. We went out to sea an hour before the race was scheduled to ensure everything was working properly. Nandan (the proud owner of the boat he’s christened SKADOOSH) was at the helm discussing the strategy for the race with his crew. The position of the flags seemed a little worrisome since we weren’t sure the race course had the minimum seven feet depth that is needed for the J/122E’s keel. Nevertheless, we decided to start the race and sail away if it got too shallow. The tactician Ayesha Lobo wasted no time arriving at a game plan for the races. Since they were sailing with 17 boats she figured it would be advisable not to start with the fleet and instead a running start a minute later was more beneficial (and safer!). The pre-start tactic worked and before they were heading to the windward mark at an average speed of 7.9 knots, striving to find a balance between speed and point. Halfway through the race, they had an altercation with another boat and had to “un-wind” themselves (admirably done by Nandan at the helm). Nevertheless, the team worked like clockwork and systematically played a number of shifts with some great crew-work to finish in second! At the start of the second race the same strategy was applied— steer well clear of the chaos at the start gun! At first, it appeared this was a smart move considering the fact that the race had three false starts (general recalls). However, on the final start, we had an encounter with another boat! 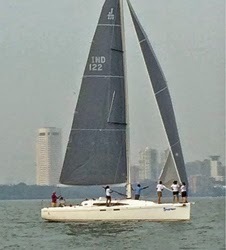 As you can guess by now, the “ISAF sailing rules” are still being learned in Mumbai’s offshore community! To avoid a collision, they were forced to spin around 360 degrees and start behind the other boats. On any other boat, this would have cost them the race. However, SKADOOSH managed to catch up sailing high and fast with her main and jib and managed to finish a very satisfying second place. As a result, with two seconds they won the regatta! After the racing, the wind picked up speed and the crew enjoyed practicing tacks as they zigzagged their way through the mooring field. 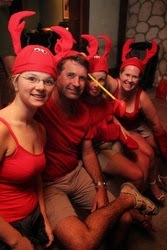 Ultimately, it was time to celebrate their successful outing aboard the beautiful SKADOOSH. They dropped anchor and sat back to enjoy a few sandwiches and refreshments while watching the beautiful sunset on-board the magnificent J/122E. “SKADOOSH is a perfect cruising and racing sailboat,” according to Nandan! "Plenty of room and light below and, on deck, great seating for everyone to enjoy themselves! Plus, it's fast!" The regatta was an undoubted success – the Chief of Naval Staff for the Indian Navy was suitably entertained from his helicopter that hovered around the fleets as they raced! The prize ceremony convened at Jawahar- a giant ship-shaped concrete structure, named after our first Prime Minister- Pandit Jawaharlal Nehru- who laid the foundation stone for it in 1968. The large number of participants and the growing numbers of Sea Cadets and volunteers around Mumbai paint a wonderful picture of promoting the spirit of adventure through sailing. Hopefully, Gokaldas Ahuja’s aims and dreams are being realized now, one new sailor at a time! Thanks for the report from Ayesha Lobo of J/India. 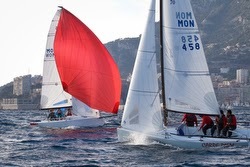 (Monte Carlo, Monaco)- After the success of the 1st edition, the Monaco Sportsboat Winter Series 2014-2015 is back to liven up the waters off the Yacht Club Monaco over the winter. 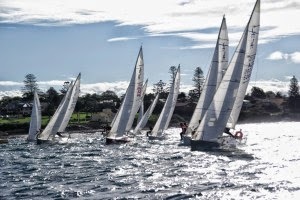 Divided into five Acts scheduled once a month from October 2014 to March 2015, these regattas are designed to give experienced and amateur J/70 crews a chance to prepare at the highest level for the upcoming season’s big regattas. This last weekend’s winter gathering of sixteen dedicated high-level J/70 teams from all over Europe, produced great racing and some surprises in the fleet sailing Hercules Bay. The YC Monaco’s PRO, Englishman John Coveney, welcomed the foreign crews to the J/70 Monaco fleet. Many of the crews are already looking forward to the 2015 J/70 European Championships that are being held in October at YCM. "It is a great pleasure to come here once a month for the Monaco Sportsboat Winter Series,” said Ekaterina Skudina, double European Champion and World Champion from Russia. She continued to say, “Three crews from the Pro-Yachting Sailing Team project came from Moscow early in the week to train, work on theory/ tactics/ strategy, go through training on the water, and work on both mental and physical preparation for offshore sailing. In addition, the teams get a direct assessment of their progress and development during the Winter regatta series. At this time of year, the YC Monaco is undeniably one of the best training bases in the Med!” There is no question the Russian team member efforts paid off; with the trio posting solid top ten performances. The German LED ZEPPELIN team, led by the 22-year-old skipper Yannick Hefner, was able to master the breeze and the Monegasque current for their first ever competition in the Principality! After posting two 2nds on the first day, they sailed brilliantly the second day to coast home with two bullets and the overall win for the weekend with just 4 pts net. The J/70 Class President of Monaco, Jacopo Carrain, sailed his CARPE DIEM both smart and fast on the first day, posting two bullets. However, on the second day, they couldn’t maintain the pressure on the LED ZEPPELIN team, posting a 3-4 to drop to second with 5 pts net. 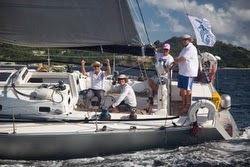 The German team from Bayerischer YC sailed UNITED DOMAINS into a well-earned third place with a 5-3-bfd-2 for 10 pts net. Just behind them were a veteran Monegasque one-design campaigner, Dennis Fredriksen sailing ARIA into fourth place just three points back. Rounding out the top five was the top Russian team, Alexander Mikhaylik sailing ALEX TEAM. In fact, the balance of the three Russians also placed well, with Alexander Kurbeko on SKOLKOVO taking 8th and Igor Puzanov on SKOLKOVO II taking 9th by virtue of losing a tie-breaker on 21 points with his Russian teammate! 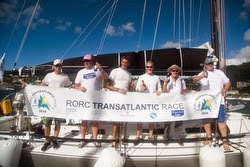 J/133 Wins RORC TransAtlantic Race! (Grand Canaria, Canary Islands)- In the mix for both IRC Class 2 leadership and also IRC Overall honors for nearly the entire duration of this year’s 2,995nm Trans-Atlantic Race was the J/133 APOLLO 7 from the United Kingdom, skippered by her owner Nigel Passmore. As they approached the final part of the race from the Canary Islands down the tradewinds route to Grenada, the APOLLO 7 team worked incredibly hard to milk the breeze for every advantage possible. In the end Passmore's British team on APOLLO 7 crossed the finish line off Quarantine Point, Grenada at 18:45:15 UTC on Monday 15th December 2014 with an elapsed time of 15 days, 08 hours, 45 minutes and 15 seconds. After time correction, APOLLO 7 not only won IRC Class Two, but took 4th IRC Overall! Nigel's team included three close friends from his hometown of Plymouth, Devon: Steve Wassell, James Slater and Mark Davies. Also on board were two offshore specialists: Dan Gohl, a past Class 40 World Champion and Sevenstar Round Britain and Ireland Record holder as well as Brett Aarons, who has won class in the Rolex Fastnet Race with Nigel Passmore in another yacht. "This morning the sun came up and I thought about home where it would be cold and miserable, and there I was at the wheel, flying along under spinnaker, in just a pair of shorts, thinking this is just heaven, and 10 of the 15 days have been just like that. At the beginning of this race, we went through the hard bit; getting out of the Canaries was tough work, fully oil-skinned up and I was thinking, what is this all about? We had a blustery period mid-Atlantic and I remember one night at the wheel in well over 30 knots of wind. It was pitch black with torrential train and difficult to read the waves, but we were racing and doing 16 knots into the abyss. We didn't take the kite down or put another reef in, we kept pushing hard and the challenge of a race is that on top of seamanship, you have the tactical consideration of beating other boats. You know you have to keep driving on if you are going to succeed. This is something I have wanted to do for 20 years or more and to do it, you have got to get yourself in the right frame of mind. Two years ago, something happened to an old friend of mine and I thought I had to do it now. I had my 50th birthday recently and I thought, come on, you have to start doing a few of these things. (Key West, Florida)- High-speed foiling catamarans, 72-foot Maxi yachts, and large classes of exciting sportboats are heading to the Florida Keys. 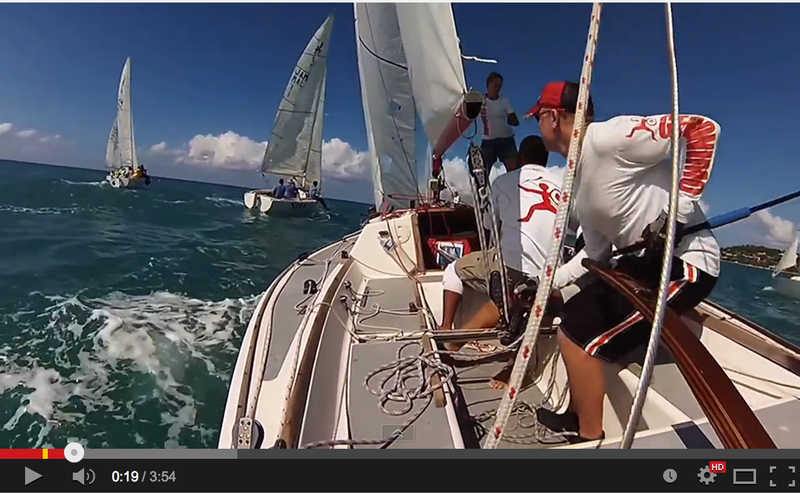 Quantum Key West Race Week 2015 will once again showcase the full spectrum of sailboat racing amid the beautiful setting of aqua-colored waters and warm sunshine from January 18 to 23, 2015. Many of the world’s best sailors will come to the Conch Republic for the 28th edition of Key West Race Week. 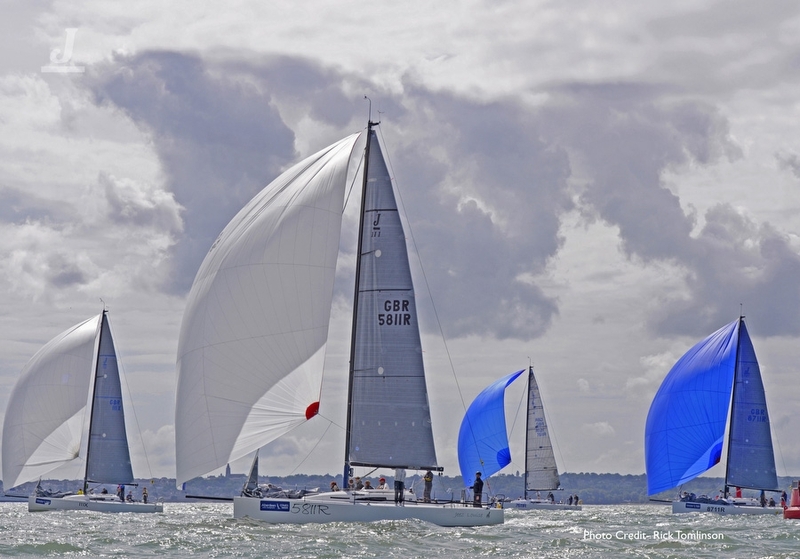 For the fourth consecutive year, Quantum Sail Design Group will serve as title sponsor of the iconic event, which is organized by Premiere Racing. 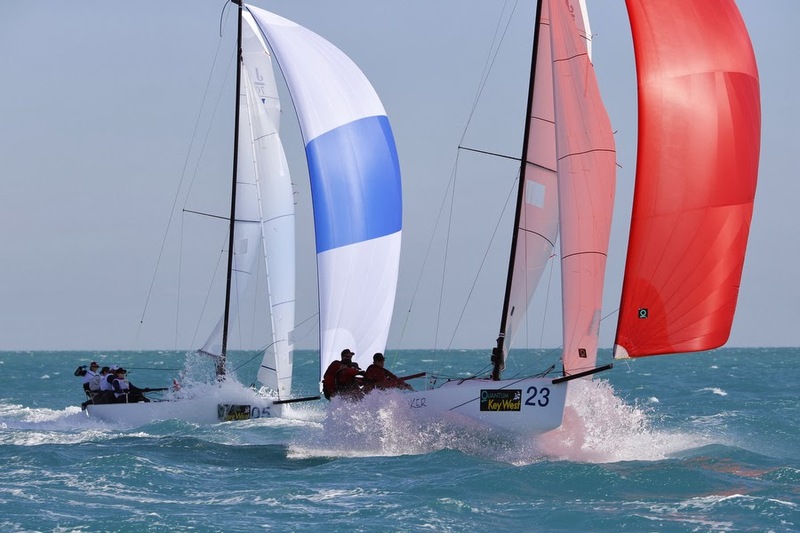 One-design racing continues to increase in popularity worldwide and there will be several strong classes at Key West. 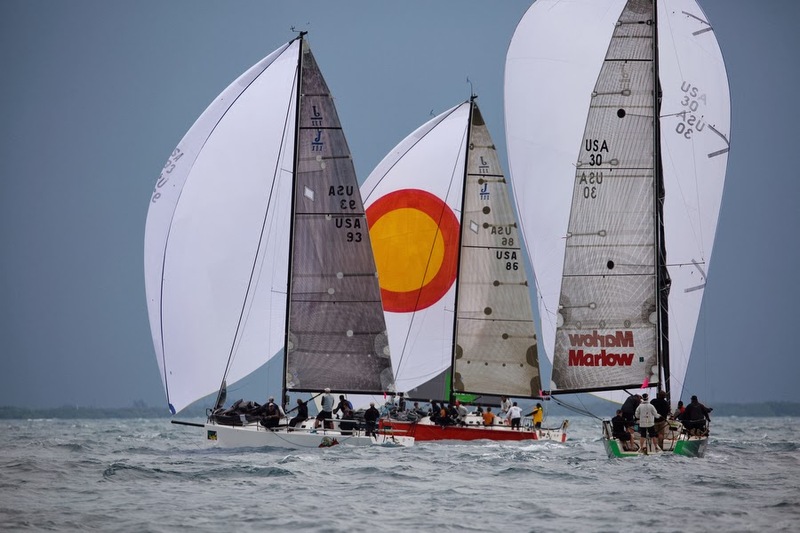 For the third straight year, the J/70 will be the largest class in Key West with a whopping forty-seven boats entered so far. Jud Smith (Africa- Marblehead, MA), Mauricio Santa Cruz (Bruschetta- Brazil) and Carlo Alberini (Calvi Network- Italy) are among many well-known skippers that will be competing this year. In addition, Premiere Racing is thrilled to have a pair of J/Boat classes making one-design debuts at Race Week. To date, the J/111 has attracted seven boats while the J/88 has six on the scratch sheet. Cleveland skipper Rob Ruhlman steered his J/111 SPACEMAN SPIFF to victory in PHRF 1 last year and is looking forward to one-design racing against other J/111s. This will be the 13th Key West for Ruhlman, who is President/CEO of Preformed Line Products. Ruhlman started coming to the Conch Republic in 1994 with a Tripp 26 and has also raced a Mumm 36, Farr 40 and 1D35 in the regatta. (Tampa, Florida)- The second annual J/70 Quantum Winter Series hosted by Davis Island YC saw an enormous turnout of forty-seven teams eager to enjoy sailing in the warm, southern climate of Florida. While the weather looked promising, with sunny skies all weekend, it was the breeze that proved difficult for both competitors and race management. A waning cold front produced decent NNW breezes on Saturday’s racing, permitting DIYC PRO Judy Hanlon to squeeze in four races before the breeze diminished. However, Sunday dawned bright and sunny and no amount of praying by all was enough to summon the seabreeze by early afternoon. The sailing on Saturday produced remarkable results for just about everyone in the top ten, perhaps the first time in recent memory that literally every single boat had a double-digit score to drop in just four races! As it turns out, the top three boats were nowhere near the top five after two races! Nevertheless, in the end, it was “home boy” Marty Kullman and his able-bodied crew aboard NEW WAVE that took the regatta win with a 15-2-2-1 for 20 pts total. Starting in a similar manner, current J/22 World Champion Allan Terhune sailed his J/70 DAZZLER to second overall with an equally crazy “snakes & ladders” scoreline of 14-3-1-3 for 21 pts. Perhaps remembering that amazing first day of glory at Key West two years ago, Cole Allsopp and friends on MOXIE dialed it all in and sailed a solid series to take 3rd overall with a record of 5-12-3-2 for 22 pts. Close it was for the top three! Notably, all the top three overall took the top three spots in the last race— guess it took this talented group a few tries before they all finally got it right! Rounding out the top five were the 2013 Key West Midwinters Corinthians winner, Dave Franzel on SPRING, taking fourth place. They were followed by Will Welles on RASCAL. Notably, class newcomer Jack Franco from Houston, Texas sailed USA-3 to a 3-4-5 to be leading the regatta after three races! However, whatever the genie was telling them to do suddenly called it quits and dove back into the magic bottle- their last race 26th dropped them to 8th overall- ouch! As he has done in the past, Rob Britts sailed HOT MESS to the overall Corinthians Team win with 31 pts. They were followed by Andrew & Melissa Fisher’s BUTTON FLY in second and in third was Noel Clinard’s LOONATICTU. A n excellent “training” feature for the regatta was the introduction of “live” broadcast of any teams using the RaceQs.com “tracking app” (Android and Apple iOS). There was a lot of lively conversation in the subsequent coaching analysis post-racing at the Davis Island YC bar! Check out the app here at RaceQs.com (http://www.raceqs.com). The “live” broadcast 3D replays are available here. In particular, do the comparison of NEW WAVE vs DAZZLER vs SPRING on a race-by-race basis; it provides some fascinating insights on how each “player” approached the upwind and downwind legs! Whether Ur Naughty or Nice, It's Not Too Late!! Get The Perfect Gift For Your Favorite Sailors! (Newport, RI)- HOT Off the Press! Order your J/Calendar 2015 now! There’s still enough time to fill stockings or toss some gifts under the tree for your favorite sailors! For 2015, we have created another beautiful calendar for J sailors who love the joys of sailing a J in some of the most spectacular harbors and waters of the world. Whether you are a cruising, racing or armchair sailor, these stunning sailboat photographs will transport you to wonderful sailing experiences in far away places. The 2015 sailing calendar features photos of J/70s flying off Monte Carlo & Lake Garda; J/24s dueling off Sweden, Newport & Seattle; surrealistic J/80s off Santander, Spain; J/120s gliding off San Diego; J/111s serenely sailing on the Solent; J/22s sailing off the Netherlands; and other gorgeous images of J/105s and J/122. A great gift for loved ones, family, friends and crew (see gallery here). Order your 2015 J/Calendar today here! J/22s getting some “Snow and sailing satisfaction”! (Charlevoix, Michigan)- Nothing diminished the enthusiasm and hot-blooded passion to get out on the water for this intrepid trio of J/22s. Using a snow-blower to access the docks, they dusted off their J/22s and went for an afternoon sail on the nice, wide-open, boat-less harbor in Charlevoix, Michigan. Perhaps one of the perfect little harbors to go “frostbite” sailing since it’s nearly landlocked on crystal clear, azure waters. Plus, it’s easy to setup a short course right off the docks of Irish Boat Shop where there’s plenty of warm grog and roaring fires! 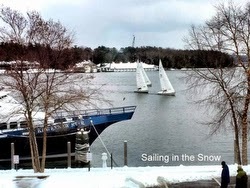 Learn more about J/22 frostbite sailing at Irish Boat Shop in Charlevoix, Michigan. Racing at its absolute best! “Fourteen J/24s on the water on a Sunday. Seventy Sailors. Blue skies. Perfect winds. Three blistering races. And excellent race management. The most active keelboat class on the bay ‘giein’ it laldy’ as they say in Scotland. Was it a state titles? Was it a National Championship? Was it a regatta? Nope! Just a normal J/24 Sunday race day! As predicted, this season is turning out to be like no previous J/24 season. The days when Pacemaker would win race after race by ten boat lengths are gone. There are now any one of five boats that can win a race and the latest development is that even some of the historic middle markers are popping up at the pointy end. There now is no boat that is noticeably quicker than any other and the J/24s are now producing racing that is all about seamanship, tactics, crew work and reading the shifts. Feel like you are missing out? Rob Date (Victorian Ocean Racer Of The Year and owner/skipper of Scarlet Runner) doesn’t, he skippered Hyperactive for a sprint day. Albert Doggett (Fast Company) doesn’t, he trimmed on Crackerjack. Geoff Wood (Fast Company and Calm) doesn’t, he trimmed on Crackerjack earlier in the season. Marissa Chalkley (owns Hush) doesn’t, she crews on Jet. Husband Pete Chalkley and Marissa both crewed on Code Violation in the NSW state titles. Peter Fitzgibbons “Fitzy” (Veloce) doesn’t, he crews on J/Force. Joelle Roderick (38 degrees) doesn’t, she crews on Hyperactive. Hey, the list is long and I don’t want to lose our dear reader, but you’ve just got to try this stuff! (Buenos Aires, Argentina)- Over the past few weeks, the Argentina J/24 class was hosting two major regattas on the Rio del Plata, hosted by Club Nautico Olivos. 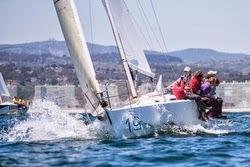 The first regatta was the J/24 Argentine Nationals and the second was the Pan Am Qualifiers in J/24s for the 2015 Pan American Games in Toronto, Ontario, Canada. The Nationals took place over two weekends, starting on November 22nd and 23rd and concluding on November 29th & 30th. 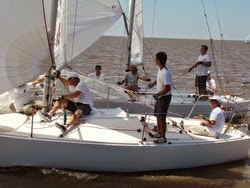 The regatta saw fifteen teams participating, a great turnout for the Argentine J/24 class. Teams showed up from Buenos Aires, Bariloche, Cordoba, Mendoza and Mar del Plata J/24 fleets. After three days of racing, very light winds marred the first weekend of sailing, the CNO PRO managing to get in just three races. The following weekend, the CNO PRO- Ernesto Lupi managed to squeeze in three more races in reasonable breezes on Saturday, thanks to their early start at 1100 hours. In the end, the team on CARRERA, skippered by Matias Pereira with crew of Augusto Rossi, Roberto Bellinoto & Federico Ambrus managed to hold onto their lead from the first weekend to take the championship by just one point. Sailing in the Nationals for the first time, Rodrigo Benedetto and his team of Alejandro Giralt, Augusto Bassanetti, Hernan Suarez & Sebastian Peri Brusa took second place by winning two of the six races! The LUCA VIVES team of Alejo Rigone, Gustavo Gonzalez, Joaquin Suarte Argerich, Fernando Gwodwz & Matias Maffioli took third place on a tie-breaker. Rounding out the top five were Santiago Doval in 4th and Chiqui Figueroa in 5th. The Argentina selection qualifiers for the Toronto 2015 Pan Am Games took place this past weekend. The most significant difference for the Pan Am qualifiers versus the Nationals is that the boats sailed with 100% jibs only and there were only four crew members permitted for each boat. Yet again, Matias Pereira’s crew on CARRERA (Federico Ambrus, Guillermo Bellinotto & Juan Pereira) sailed like champions to become the Argentina representative in the 2015 Pan Am Games. The three-day selection event was again characterized by unusually light winds. Eight teams participated in the event. The first day saw light 6-8 kts NE winds with remarkably large wind shifts all day. The CNO Race Officer- Santiago Sharpin- managed to run three races. Yet again, Pereira established an early lead the first day, never to relinquish it until the end of the regatta. The second day saw drizzle, light unstable air from the ESE and reduced visibility to some fogginess. Nevertheless, after postponing sailing until 1340 hrs, the first race started and Aeljo Rigoni’s LUCA VIVE won the first race of the day. Another postponement ensued with the second and last race of the day started at 1640 hrs. Despite the light winds and lousy weather, CARRERA won the 5th race of the series to lengthen their lead over the fleet. Nevertheless, the racing was very tight and close together, with the entire fleet finishing in less than two minutes! (Seattle, WA)- “74 hearty boats and crews made the Dec 6th start off the slag pile near Ruston to compete in the second ever counter-clockwise race Around Vashon Island, the first installment in the 2014/2015 South Sound Sailing Series. It felt like a warm fall day out there compared to last year’s 24 degree temps and for all those that want a screamin’ deal on a Christmas tree or even several cords of wood, the Fall Vashon was for you - formerly regarded as Winter Vashon, I stand corrected by prominent members of Tacoma Yacht Club that winter doesn't start till Dec 21st! Back to the tree issue, apparently the recent giant tides, northerly winds and extreme river runoff pulled everything imaginable off the shoreline and deposited it in Commencement Bay. There was more driftwood afloat on the Southern Puget Sound than is standing in the forests nearby! The calls at the start line were interesting in the light air – “one boat length, boat to leeward, log ahead, don’t come up or you’ll catch the shrubbery!” Grass clippings, shrubbery, and a copious amount wood from stumps to deadheads- it was all out there, and fortunately for everyone the wind was so calm and the water so flat that it was easy to foresee these hazards and take evasive action. The deliveries to TYC on Friday were pleasant and even a 6am start Saturday out of Des Moines was downright enjoyable. OK, a full thermos of hot coffee was helpful there. TYC made everyone feel welcome, as usual, with free moorage, dinner Friday night, use of the small boat hoist, friendly staff, and a hearty Saturday morning breakfast. The course was "innovative" this year with two virtual marks at the North end of Vashon. I've always felt Swiftsure Bank and for those that can remember back that far, the Cobb Seamount, were virtual as well, so for inland sailors to have a chance to round not only one but actually two virtual marks, a challenge to be certain. The start was light, with just enough wind to get to the line and have steerage to dodge the debris. The forecast southerly was promising though and every time you got that little puff it was a header so spinnakers were the order of the day with the racing fleet chasing the burgeoning cruising fleet East across Commencement Bay. The tugboats must work hard on the weekends down here as two were required to plow through the start line and create a few delays. Small boats, that start first, seemed to have some advantage in these conditions because even as far into the race as the North end of Vashon Dennis Clark, in his J/27 LXIII, was still in the company of 40‘ers! Point Robinson was the first geography gate and those that were willing to play a little West in the light South westerly started slipping north to lead the charge into the stronger winds. It was obvious light is fast on December 6th and the ability to just be plain slippery paid. What a gorgeous day, too, as Mt. Rainier was clearly visible and you could identify the airliners by the paint on their tail every couple minutes rising out of SeaTac Airport. Boats swapped gybes and pleasantries as they hull speeded their way north to the mysterious virtual gate. Which headsail to use? How windy is Colvos passage going to be? Discussions were required and the lead boats were visually inspected as they began to heel over on their way South into the passage. Where is my weather drone when I need it? 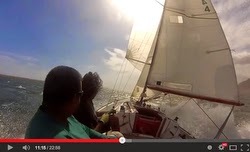 If you ever wanted to see what a boat can do upwind sailing well, this was your day. The J/133 CONSTELLATION was deadly as they stampeded South down Colvos passage under a heavy spread of canvas. After correction in the IRC fleet, John McPhail’s gorgeous navy-blue J/160 JAM took second. Class 2 was dominated by the J/133 CONSTELLATION, owned by Ron Holbrook. Class 3 was not an easy task in a class of five, count em‘, five J/35’s and two J/109s! All very capable and fast designs. Taking second in class was the always well-sailed J/109 TANTIVY. Class 4 saw one of the West Sounds fastest J/105’s take third- DULCINEA. Class 5 once again watched that beautifully maintained J/29 SLICK, owned by Mayfield & Nelson, slip into first place in this always tight class. Almost taking the spread on the day was the amazingly rebuilt J/27 LXIII, owned by Dennis Clark - taking Class 6 by over 35 minutes! Behind them in third was the well traveled J/27 TRUE NORTH. As the sun went down on the 2014 Winter Vashon so did the wind, the lights of TYC started to twinkle as the last few boats made the slow crawl to the finish watching their hopes of correcting out on the "Big Boys" slipping away again. A cup of holiday cheer and a warm bunk never sounded better as the sails were furled and hatches were battened down for a long winter’s night. (San Cristóbal, Dominican Republic)- Celebrating their 20th anniversary, Denis Cartier’s model-making business- Abordage.com- has produced a number of gorgeous J/models, ranging from the J/22, J/24, J/70, J/80 up to the J/109, J/122 and J/44. With their great devotion to both the sea and sailing, Abordage has been proudly producing beautifully handcrafted ship models, either classic or modern ships, since the Company’s inception in 1989. From their well-established boat yard in the Dominican Republic, the highly skilled team of craftsmen works with only the finest of materials and produces every ship model in minute detail and with innovative perfection. 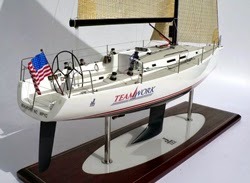 If you have an interest in these remarkably affordable models of your boat, please visit- http://www.abordage.com. For J/Model examples, please take a look at some of the stunning detail here. The Perfect Gift For People Who Love Sailing! (Newport, RI)- HOT Off the Press! Order your J/Calendar 2015 now! There’s still enough time to fill the stockings or toss some under the tree for your favorite sailors! J/70s Eclipse PHRF Class 4! (San Diego, CA)- For the three weekends that comprise the San Diego YC’s Hot Rum Series, it’s clear the veterans know you can expect just about anything the weather Gods can throw at you— from full-on gales to simply no wind- known as a “glass out”. While the first weekend offered somewhat reasonable racing, the last two races of this year’s series were fraught with peril. 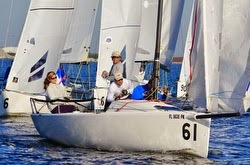 For example, Hot Rum #2 was another busy day on the water for competitors and Race Committee. With the addition of a nice westerly breeze, maneuvers at the start line were much easier to accomplish and nobody came in contact with the RC Signal boat. However, on the return leg, our “Check In” notice of outbound Navy Ship @ 1500 materialized. We are not given notice of what, precisely when, or how the vessels will maneuver or be getting underway. That’s (understandably) the US Navy way. Departure times for their operations are not generally subject to negotiation or influenced by recreational traffic. However, much more than you are probably aware, the US Navy makes regular considerations for recreational traffic both in the bay and in the Coronado Roads, in the course of their everyday operations. While it was unfortunate that there was also an outbound car carrier passing Ballast Point just moments before the US Navy Sub got underway, in the midst of dozens of Hot Rum competitors negotiating each other, light winds, changing tide and inbound at Ballast Point meant this mix of commercial traffic, US Navy subs and Hot Rum sailors had about as good an outcome as there could have been— e.g. complete and utter chaos reigned! Know that the Harbor Pilots and SeaTractor crew, along with the US Navy Sub Crew and Security boats accomplished their task swiftly and with much more traffic, much closer than they would ordinarily allow, without complaint. A big “Thank You” to them, and all sailors who complied with directions and alterations of course. Working together with all the various facets that make up the San Diego Bay is what makes Hot Rum Series contest unique, interesting, and possible! Then, for the following weekend, the weather Gods again didn’t cooperate, with light airs prevailing most all day and most boats roasting in the beautiful SoCal “Sunny Diego” weather. In Class 2, the J/120s turned out seven strong and some crews had a successful go of it in less than ideal J/120 sailing conditions. At the top of the heap was Chuck Nichols’ CC RIDER, taking 2nd in class and garnering top honors for J/120s. Following them was Mike Hatch’s J-ALMIGHTY at 5th in class and 2nd J/120. Third J/120 was Ernie Pennell’s TAMA JAMA. Six J/105s took up the challenge in Class 3 with Dag Fish’s VIGGEN taking class honors and 2nd in class. Third in Class and 2nd J/105 was Dennis Case’s WINGS, losing a tie-breaker with VIGGEN at 13 pts each. Notably, Herb Zoehrer’s J/35 Z-FORCE had a good outing, taking 7th in a class of 40 boats! The most surprising outcome of the series was the extraordinary performance of the top J/70s, with Dave Vieregg’s SOGGY DOLLAR winning class with Karl Pomeroy’s ZERO TO 60 taking 2nd only one point back! The third J/70 was David Cheresh’s FLARE in 8th. RORC TransAtlantic Update #2- Almost Done! (Grand Canaria, Canary Islands)- In the mix for both IRC Class 2 leadership and also IRC Overall honors is the J/133 APOLLO 7 from the United Kingdom, skippered by her owner Nigel Passmore. As they close down to the final part of the 2,900nm long Trans-Atlantic Race from the Canary Islands down the tradewinds route to Grenada, the APOLLO 7 team is working hard to milk the breeze for every advantage possible. The overall race win is difficult to predict; as the wind is likely to lighten for the leaders during their approach to the islands, but the rest of the fleet are going to begin to catch up with them. With weather models showing a consistent easterly wind after the leaders have finished, we may be looking to one of the smaller boats to lift the IRC Trophy. The APOLLO 7 is the biggest threat. And, the fleet is encountering unforeseen obstacles to their progress. On December 4th, APOLLO 7 reported on their blog, “Good morning on day five! Life onboard has fallen into a good routine as we head south. For the navigators it is like a game of chess on a massive board, right/wrong moves being rewarded or punished in sea miles. The temperature is slowly rising and it was a nice dawn with a warm breeze today, just rewards after three hours of charging along at 10+ knots into total darkness. Then, on December 8th the APOLLO 7 gang commented, “Well, is it really a week ago that we left the windy Lanzarote? When I set out on this adventure it was with the dream of long surfing downwind days with blue skies and the Atlantic has delivered it! It’s amazing, we are currently surfing due west at 12 -13 knots and have a few days ago enjoyed blasts of 20 knots, and all this on a J/Cruiseliner like the J/133! Progress should be good over the next three days with stronger winds expected and with our best 24hr run of 294 miles to beat. Could This Be Love? Grow Sailing Jamaica Style! (Montego Bay, Jamaica)- You bet mon! Since 1983, J/22s have been part of the sailing landscape in Jamaica; a beautiful, rugged, jungle festooned island in the middle of the Caribbean, renowned for “Bob Marley and the Wailers” and their unique form of reggae music. While Marley and friends like Peter Tosh continued to attract a worldwide audience for their metaphorical “chill”, relaxing rhythms and stories of life in ‘da hood in Jamaica, the J/22 also expanded as a fleet at Montego Bay Yacht Club. Not soon after the arrival of the first J/22s, many local sailors fell in love with their little boats and continued to champion their use to the local school kids and local population, encouraging one and all to enjoy sailing off the spectacular coastline along the north shore of the island. For over a quarter century, the “Jamaica, No Problem Mon” family of J/22 sailors have hosted their Jamin’ Jamaica Invitational since 1989, a wildly popular event for those “in the know”. The format was simple. 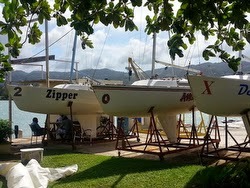 The local fleet of around a dozen boats would have their Jamaican J/22 Nationals 2-3 weeks prior to the Jamin’ Regatta, with the top two teams from each fleet “qualifying” to sail their own boats in the Jamin’ event to represent the homeland of Jamaica (MoBay and Kingston). The rest of the boats would be offered to “international” teams from around the Americas, Europe and South Africa— just about anywhere there were J/22 teams. Boats would be “drawn” out of a hat and teams of 3-4 crew could show up, use their own sails if they wished, and even enjoy local host accommodations in some of the coolest places you could ever dream about. In the early days, the first long-time J/22 Class President, Galen Freeman from Tennessee, sailed in that first event and fell in love with the club, the parties, the sailing and, most of all, the people. It’s not hard to imagine why anyone wouldn’t want to go. To say that the membership of Montego Bay YC throws down the red carpet for visiting crews and welcomes everyone in one big warm hug as “family mon!” is a bit of an understatement. After four days or more of sailing and experiencing the island, you’d swear you just picked up several new “brothers & sisters” along the way. No question, the Jamaica J/22 sailors love to have fun and love sharing it even more with their friends. A highlight of the regatta is the Saturday evening “Jamaica Stylee” Party hosted by the most amazingly sweet couple, Bryan and Lyn Langford. Dressed in 70s “stylee style”, the sailors enjoy what has to be one of the nicest potluck dinner parties you’d ever attend. With a superb “DJ playlist” of awesome reggae tunes, the sailors often leave with bellies full of the best “jerk chicken”, “pepper fish (snapper)”, “pepper shrimp” and other local delicacies while being plied with gallons of the favorite local rum--- Appleton’s! Many happy faces (sometimes goofy) are seen leaving in the wee hours of the morning. That Sunday’s racing ever gets going by 11am in the morning for the last three races is often a miracle. As a natural self-promoter in business, Rugie also recognized the need to get more kids and adults involved in the sport he all of a sudden fell completely in love with. With the help of the J/22 Jamaica class President, Richard Hamilton, they have collaborated to spearhead efforts to get more people involved, women, kids, young and old alike. They created a J/22 “promotion” video for Jamaica that is somewhat amusing and heart-warming. 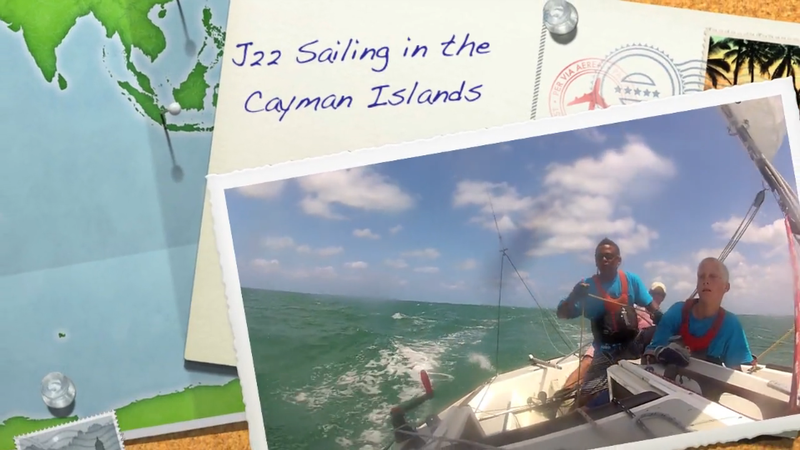 In their efforts to cast a wider net around the world, Jamaica’s J/22 fleet first invited American teams and later invited others from Germany, The Netherlands, South Africa, and, ultimately, the sailing teams from a nearby neighbor- the Cayman Islands. While Jamaica was the first J/22 fleet in the Caribbean, the Cayman fleet grew quickly in recent years. With nearly the same number of boats, their 13 teams have fielded strong one-design sailors, including Mike Farrington who recently placed third in the J/22 Worlds in South Africa. One of those teams sailing in Jamin’ this year was Team YAHOO! and included a cast of characters like Mark Edmunds (helm), Pete Bridge (trimmer), Jo Richards (foredeck) and Eduardo Bernal (rail meat, tactician, traveller, backstay, bar duty, pre-start timing, clothing coordinator, travel planner, accommodation chef de mission and anything else the team needed). Their mission statement: “Start at the front, stay at the front!” Fallback mission statement: “drink plenty, enjoy the sailing and hospitality of MoBay YC!” That just about characterizes another one of their fun-loving, marauding teams from Cayman- the brave women’s team hailing from northern Cayman- the “Vikings”. 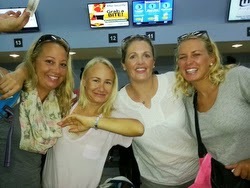 All four girls were blonds, were beautiful and were led by their skipper Suvi Hayden- her crew included Jo Richards, Kristine Verner, and Karin McGrath (a sailing instructor at the Cayman Islands Sailing Club). Besides the local “homies” and the Cayman trio of boats, the Silver Anniversary Regatta that sailed over the 6th and 7th December also saw teams from Canada and America. The regatta was blessed by idyllic sailing conditions both days. As promised by the local Chamber of Commerce cheerleader (Evelyn Harrington), “the winds are light in the morning, build from 10 to 11am, then diminish in the evening to a light cool breeze. Plus, it will be sunny all day with cottony clouds scudding across the horizon, perhaps we may get a light drizzle from a stray cloud, and the sunsets will be perfect.” She was just about 95% right. The PRO Peter Harper, with help from Commodore Nigel, support from Bryan and Lyn Langford and others all pitched in to conduct seven races in all. Saturday’s racing was quite blustery, with 15-25 kts puffs whistling over the mountainous peninsula near the windward mark with 40-60 degree shifts from the ENE wrecking havoc on every windward leg and run. The fourth and last race of the day was the standard windward-leeward 1 1/2 legs followed by a long run into the MoBay YC finish dock! The next day dawned with much lighter winds from the NNE. Thank goodness, as many teams were a bit groggy after the Saturday night festivities at the Langford’s house. Starting again at the red sea-buoy, the RC sent the fleet off on an “ocean tour” up the beaches to colorful mark names like “Doctor’s Cave” and “Hospital”. In the end, Team USA comprised of Mike Morse, Noel, Stuart Johnstone and Julia Langford took fleet honors sailing DEFENDER. In the battle for second, Richard Hamilton from MoBay took second on RENEGADE followed by Team ZIPPER from the Cayman Islands (skipper Bruce, Dave, Rob and Jenny Smith). The final leg of the last race determined the final outcome for 2nd and 3rd; ZIPPER dropped to 6th on the final run to the finish while RENEGADE took the “ocean option” downwind to snag 2nd in the race and second overall by one point. “Happy Thanksgiving” from J/Boats Cleveland! 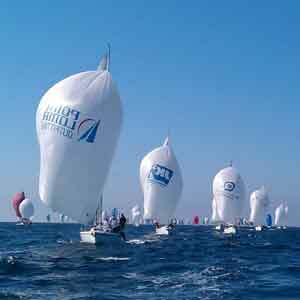 J/22 MARLOTTE V Repeats Arcachon Sailing Crown! Awesome J/24 & J/70 Worlds Photo Gifts! 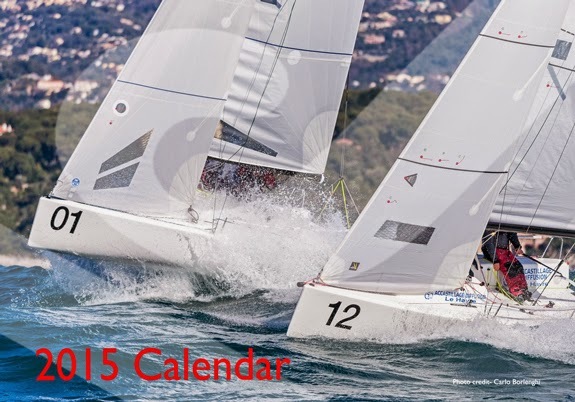 J/Sailing Calendar- The Perfect Gift for 2015! J/Teams Crush St Croix Regatta! 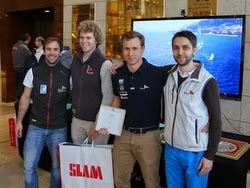 JOI de’VIVRE Repeat J/80 Benelux Champion! Bromby/ Murphy Crowned XL J/105 Bermuda Champs!